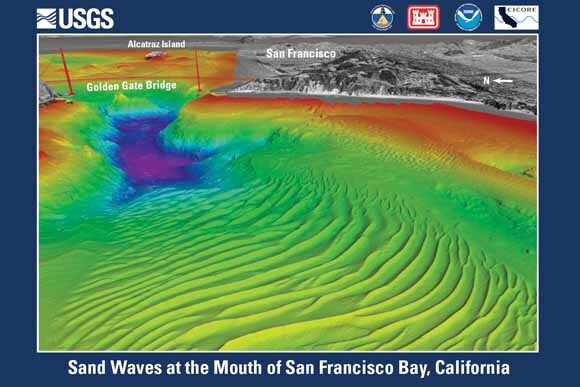 The U.S. Geological Survey; California State University, Monterey Bay; U.S. Army Corps of Engineers; National Oceanic and Atmospheric Administration; and Center for Integrative Coastal Observation, Research and Education partnered to map central San Francisco Bay and its entrance under the Golden Gate Bridge using multibeam echosounders. View eastward, through the Golden Gate into central San Francisco Bay. Depth of sea floor color coded: red (less than 10 m deep) to purple (more than 100 m deep). 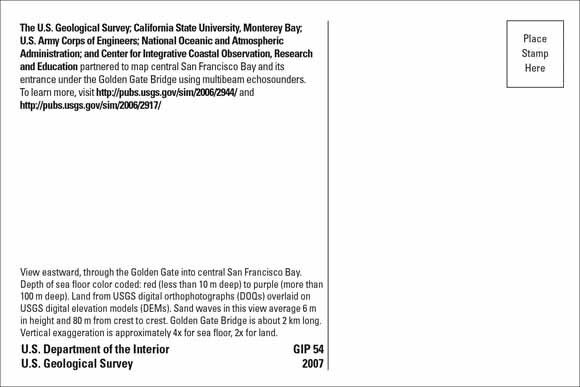 Land from USGS digital orthophotographs (DOQs) overlaid on USGS digital elevation models (DEMs). Sand waves in this view average 6 m in height and 80 m from crest to crest. Golden Gate Bridge is about 2 km long. Vertical exaggeration is approximately 4x for sea floor, 2x for land. You can make a nice postcard by downloading the PDF linked below; load your printer with stiff paper, print only page 1, put the paper back in the printer facing the back side, print only page 2, and cut the postcard out with scissors. If you have access to a paper cutter, you might consider using the version with crop marks (linked below). This one prints out beyond the edge of the postcard so when you cut on the marks, you get ink clear out to the edge with greater ease.